Atmospheric carbon dioxide enrichment alters seawater carbonate chemistry, thus threatening calcifying organisms such as corals. Coral populations at carbon dioxide vents are natural acidification experiments that mimic organism responses to seawater pH values projected for 2100. Even if demographic traits are paramount information to assess ecological relationships and habitat suitability, population dynamics studies on corals thriving under acidified conditions are lacking. Here, we investigate the demography and reproduction of populations of the solitary, symbiotic, temperate coral Balanophyllia europaea naturally living along a pH gradient at a Mediterranean CO2 vent. Gametogenesis and larval production were unaffected while recruitment efficiency collapsed at low and variable pH, contributing to coral abundance decline and suggesting that life stages between larval release and early polyp growth are hindered by acidification. Exploring these processes is crucial to assess coral fate in the forthcoming acidified oceans, to preserve coral ecosystems and the socioeconomic services they provide. 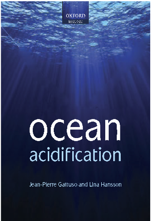 Ocean acidification can reduce the growth and survival of marine species during their larval stages. However, if populations have the genetic capacity to adapt and increase their tolerance of low pH and high pCO2 levels, this may offset the harmful effects of ocean acidification. By combining controlled breeding experiments with laboratory manipulations of seawater chemistry, we evaluated genetic variation in tolerance of ocean acidification conditions for a nearshore marine fish, the California Grunion (Leuresthes tenuis). Our results indicated that acidification conditions increased overall mortality rates of grunion larvae, but did not have a significant effect on growth. Groups of larvae varied widely with respect to mortality and growth rates in both ambient and acidified conditions. We demonstrate that the potential to evolve in response to ocean acidification is best described by considering additive genetic variation in fitness‐related traits under both ambient and acidified conditions, and by evaluating the genetic correlation between traits expressed in these environments. We used a multivariate animal model to estimate additive genetic (co)variance in larval growth and mortality rates under both ambient and acidified conditions (low pH/high pCO2). Our results suggest appreciable genetic variation in larval mortality rates (h2Ambient = 0.120; h2Acidified = 0.183; rG = 0.460), but less genetic variation in growth (h2Ambient = 0.092; h2Acidified = 0.101; rG = 0.135). Maternal effects on larval mortality rates accounted for 26‐36% of the variation in phenotypes, but maternal effects accounted for only 8% of the variation in growth. Collectively, our estimates of genetic variation and covariation suggest that populations of California Grunion have the capacity to adapt relatively quickly to long‐term changes in ocean chemistry. The impact that ocean acidification (OA) could generate in the fisheries of Isostichopus badionotus at the north of the Yucatan Peninsulta, Mexico, was analysed by reducing the value of a parameter of the Beverton-Holt recruitment function, in accordance with the acidification scenarios of the Intergovermental Panel Panel on Climate Change (IPCC). The behaviour of the stock and the resulting fishery were analysed in a bioeconomic model structured by age, taking into account different market prices and fishing efforts. The results were compared in decision matrices that used the MiniMax and MaxMin criteria to determine the management strategy that best reduced the impact of acidification. The largest stock reduction occurred during the first years of exploitation (B10>B15/BO) and all the variables that were considered did stabilize with time, reaching bioeconomic equilibrium. The worst scenario for not considering acidification occurred with low market prices, while the increase in price decreased the exploitation rate. The recruitment reduction determined the maximum effort that should have been applied; under such conditions it is recommended to operate an effort of 137 boats, considering the best market price. 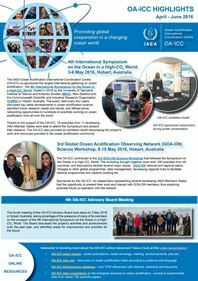 Ocean acidification is hypothesized to limit the performance of squid owing to their exceptional oxygen demand and pH sensitivity of blood–oxygen binding, which may reduce oxygen supply in acidified waters. The critical oxygen partial pressure (Pcrit), the PO2 below which oxygen supply cannot match basal demand, is a commonly reported index of hypoxia tolerance. Any CO2-induced reduction in oxygen supply should be apparent as an increase in Pcrit. In this study, we assessed the effects of CO2 (46–143 Pa; 455–1410 μatm) on the metabolic rate and Pcrit of two squid species – Dosidicus gigas and Doryteuthis pealeii – through manipulative experiments. We also developed a model, with inputs for hemocyanin pH sensitivity, blood PCO2 and buffering capacity, that simulates blood oxygen supply under varying seawater CO2 partial pressures. We compare model outputs with measured Pcrit in squid. Using blood–O2 parameters from the literature for model inputs, we estimated that, in the absence of blood acid–base regulation, an increase in seawater PCO2 to 100 Pa (≈1000 μatm) would result in a maximum drop in arterial hemocyanin–O2 saturation by 1.6% at normoxia and a Pcrit increase of ≈0.5 kPa. Our live-animal experiments support this supposition, as CO2 had no effect on measured metabolic rate or Pcrit in either squid species. Ocean acidification has the potential to significantly impact both aquaculture and wild-caught mollusk fisheries around the world. In this work, we build upon a previously published integrated assessment model of the US Atlantic Sea Scallop (Placopecten magellanicus) fishery to determine the possible future of the fishery under a suite of climate, economic, biological, and management scenarios. We developed a 4x4x4x4 hypercube scenario framework that resulted in 256 possible combinations of future scenarios. The study highlights the potential impacts of ocean acidification and management for a subset of future climate scenarios, with a high CO2 emissions case (RCP8.5) and lower CO2 emissions and climate mitigation case (RCP4.5). Under RCP4.5 and the highest impact and management scenario, ocean acidification has the potential to reduce sea scallop biomass by approximately 13% by the end of century; however, the lesser impact scenarios cause very little change. Under RCP8.5, sea scallop biomass may decline by more than 50% by the end of century, leading to subsequent declines in industry landings and revenue. Management-set catch limits improve the outcomes of the fishery under both climate scenarios, and the addition of a 10% area closure increases future biomass by more than 25% under the highest ocean acidification impacts. However, increased management still does not stop the projected long-term decline of the fishery under ocean acidification scenarios. Given our incomplete understanding of acidification impacts on P. magellanicus, these declines, along with the high value of the industry, suggest population-level effects of acidification should be a clear research priority. Projections described in this manuscript illustrate both the potential impacts of ocean acidification under a business-as-usual and a moderately strong climate-policy scenario. We also illustrate the importance of fisheries management targets in improving the long-term outcome of the P. magellanicus fishery under potential global change. • In this study, pH and Ca2+ microsensors were reported together with a theoretical analysis by a reaction-diffusion model to study the dynamics of pH and Ca2+ in the coelenteron of the reef corals Turbinaria reniformis and Acropora millepora. • Our study showed that Ca2+ concentrations linearly decreased from the mouth to the base of the coelenteron due to calcification. • The estimated H+ gradient between the coelenteron cavity and the calcification site was >10 times higher than previously predicted between outside seawater and the calcification site. • Our numerical simulation reveals that OA reduces the internal pH at the base of the coelenteron, and this pH decline is greatly amplified in corals with a deeper coelenteron. Scleratinian corals (hard corals) and their symbiotic algae are the ecological engineers of biodiverse and geological important coral reef habitats. The complex, linked physiological processes that enable the holobiont (coral + algae) to calcify and generate reef structures are consequently of great interest. However, the mechanism of calcification is difficult to study for several reasons including the small spatial scales of the processes and the close coupling between the symbiont and host. In this study, we explore the utility of pH and Ca2+ microelectrodes for constraining the rates and spatial distribution of photosynthesis, respiration, and calcification. The work focuses on vertical profiles of pH and Ca2+ through the coelenteron cavity, a semi-isolated compartment of modified seawater amenable to quantitative interpretation. In two studied species, Turbinaria reniformis and Acropora millepora, Ca2+ concentrations decreased in a roughly linear manner from the mouth to the base of the coelenteron, indicating the primary physiological process affecting Ca2+ concentration is removal for calcification below the coelenteron. In contrast, the H+ concentration remained relatively constant over much of the coelenteron cavity before it increased sharply toward the base of the coelenteron, indicative of proton-pumping from the calcification fluid below. The estimated H+ gradient between the coelenteron cavity and the calcification site was >10 times higher than previously predicted. Consequently, the energy required to export protons from the calcifying fluid was estimated to be ~3 times higher than previously calculated. A one-dimensional reaction-diffusion model was used to interpret the pH profile considering the effects of photosynthesis, respiration, and calcification. This model provided a good fit to the observed pH profile and helped to constrain the rates and spatial distribution of these processes. Our modeling results also suggested that adult corals with deeper polyps may be more sensitive to ocean acidification (OA) because of enhanced difficulty to transport H+ out of the coelenteron and into the surrounding seawater.